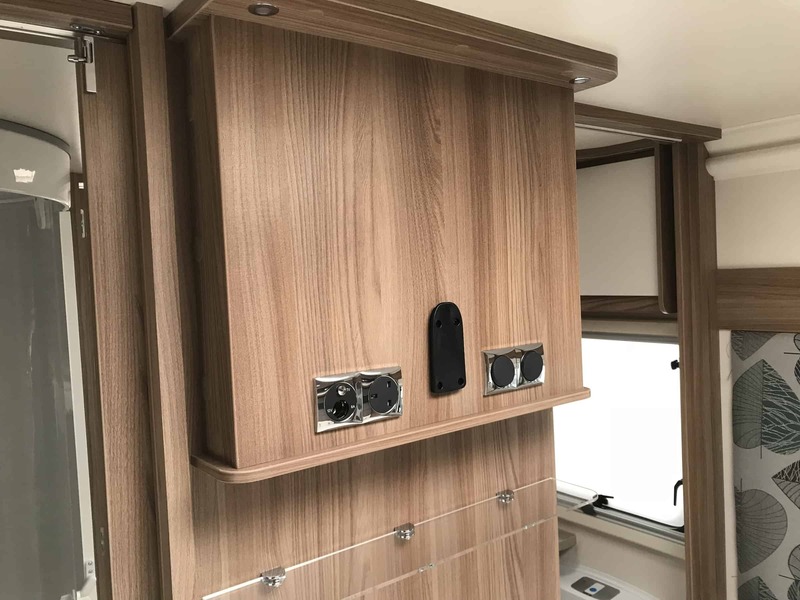 fitted with upgrade Fabric option . 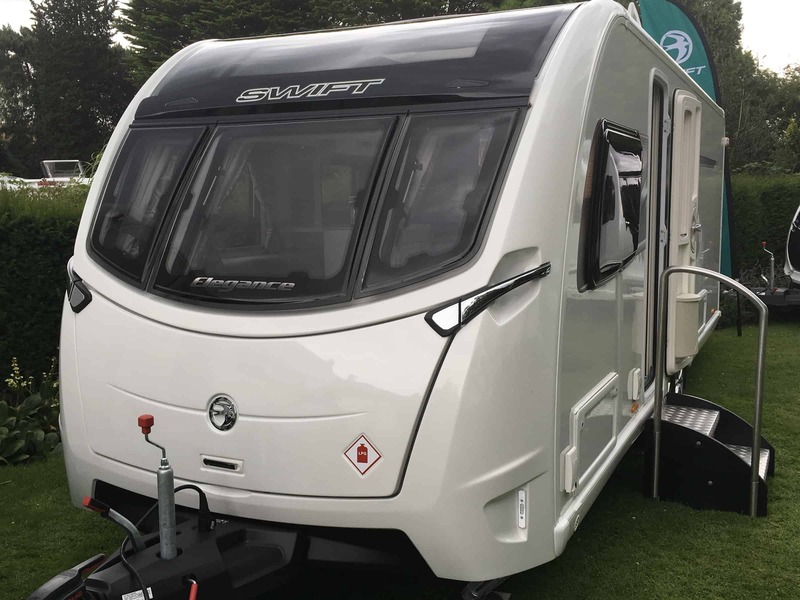 The Swift Elegance offers an exquisitely refined touring experience that is second to none – lavishly appointed and perfectly proportioned. 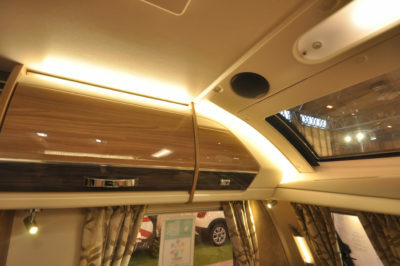 The luxurious interior is immaculately designed and cleverly detailed. ’Falisolle’ soft furnishings emphasise the Elegance’s opulent feel. 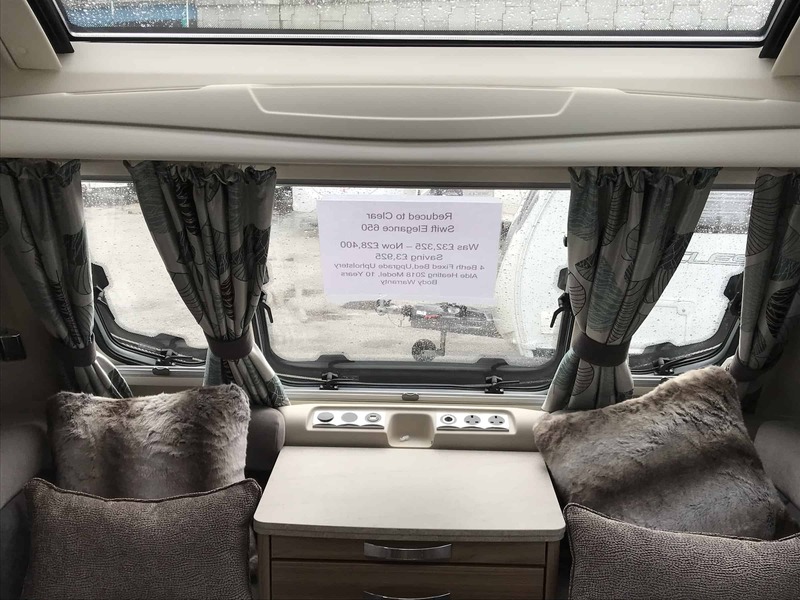 Lavishly appointed and perfectly proportioned with six layouts including two twin axle models, the Elegance range ensures your touring is as comfortable as it is memorable. 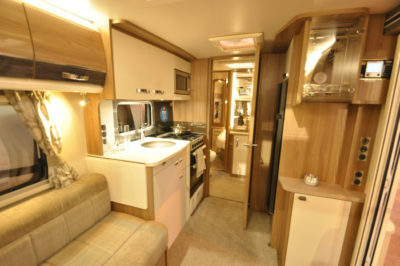 Fully equipped, the Elegance comes with a five star specification. Sporting chrome effect grab handles, an enhanced stylish graphics scheme and handy rear view camera, the Swift Elegance effortlessly stands out from the crowd. 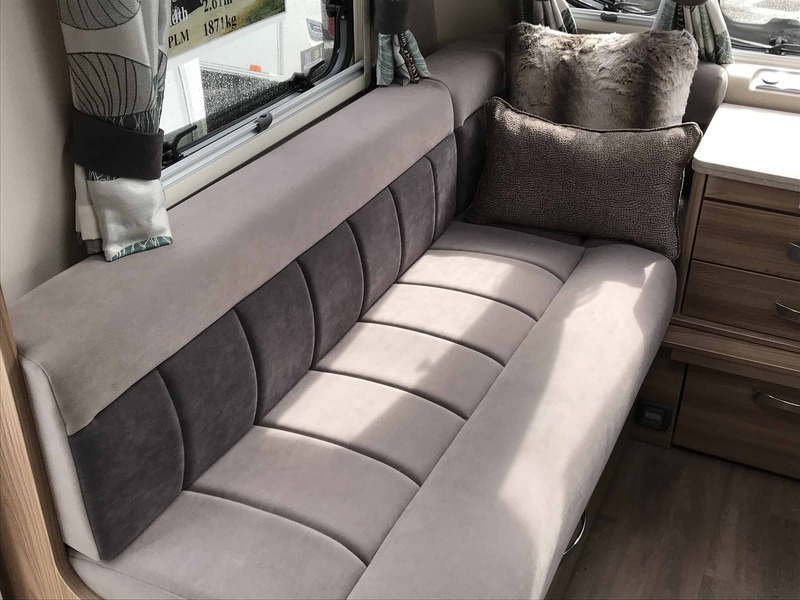 ’Falisolle’ soft furnishings emphasise the Elegance’s opulent feel. 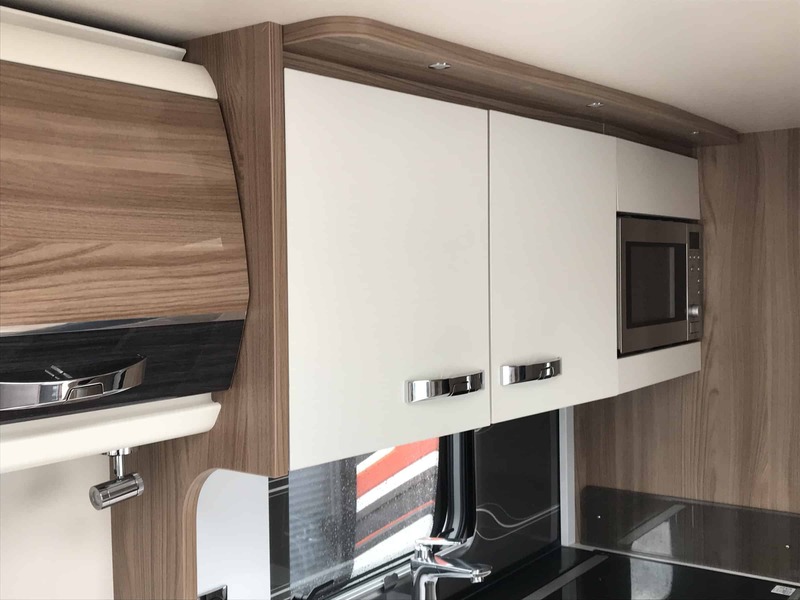 A well-appointed kitchen is fitted with HI-MACS® natural acrylic stone worktops, illuminated kitchen splashback and Dometic appliances including the exclusive Dometic CU600 oven, and a spacious tall Dometic fridge in most models. 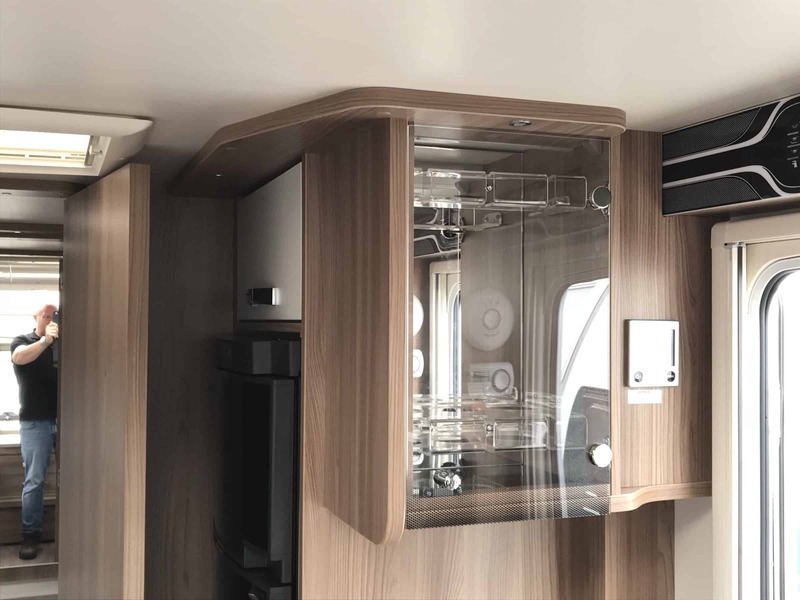 There’s even an LED lit cocktail cabinet. 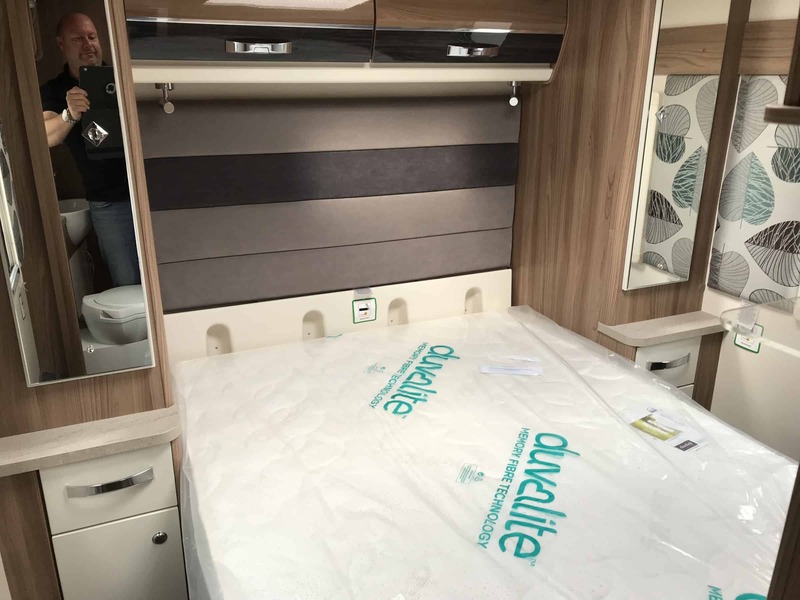 Fixed beds are topped with the ultra-comfortable Duvalay Duvalite mattress, exclusive as standard equipment to the Swift Group. 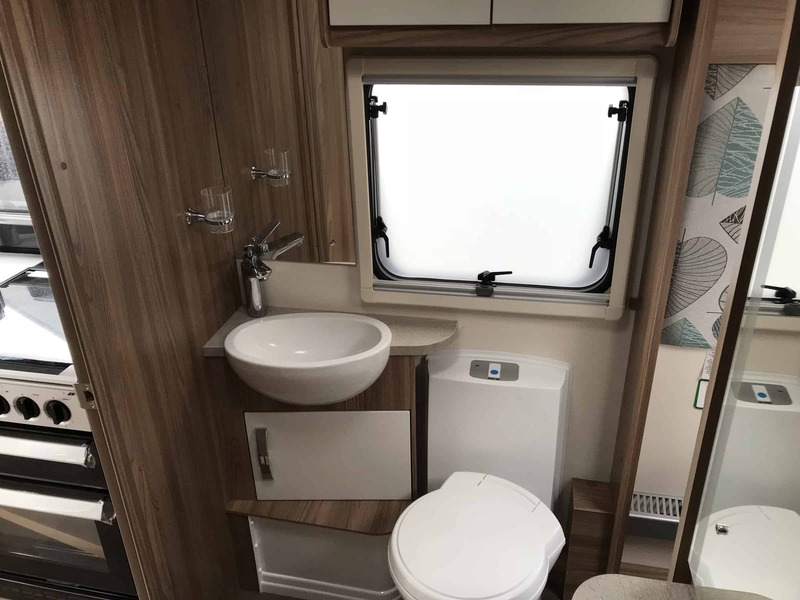 The enhanced Swift Command control system, with ‘app’ interface, remotely monitors and manages onboard functions like heating and lighting, and also features the option to subscribe to a pre-installed Thatcham Category 6 approved pro-active tracker, to keep your investment better protected. 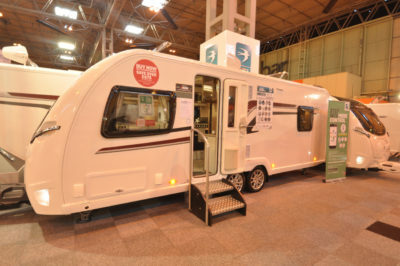 It’s all very well calling a caravan range Elegance, but how do you live up to such a name? 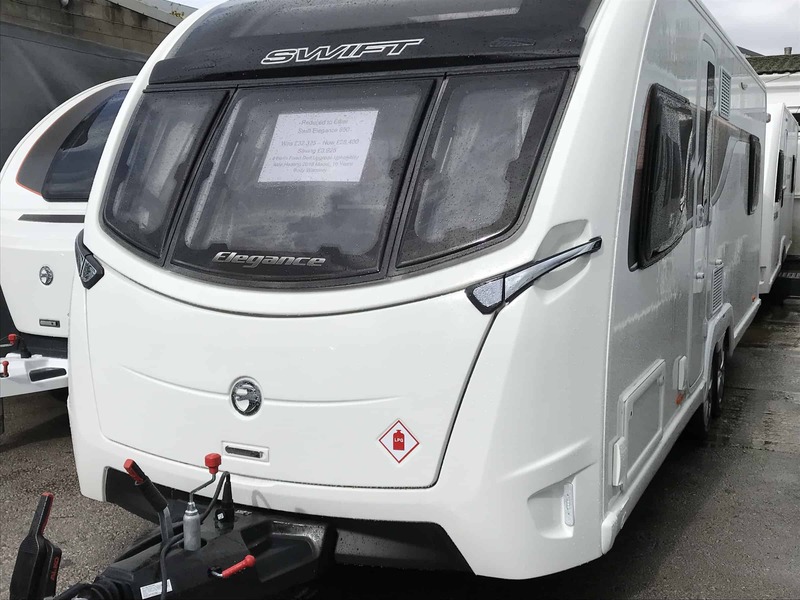 Well, Swift’s seven-model line-up is topped off by this twin-axle, a new model for the 2017 season. 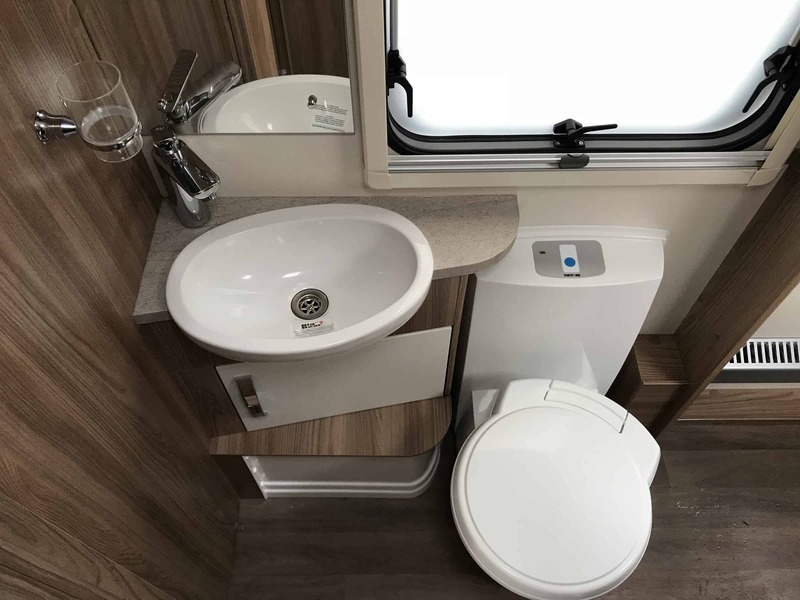 Although billed as a four-berth, you can’t help feeling at least half of its appeal will be to couples who are perfectly happy to mix substance and style. 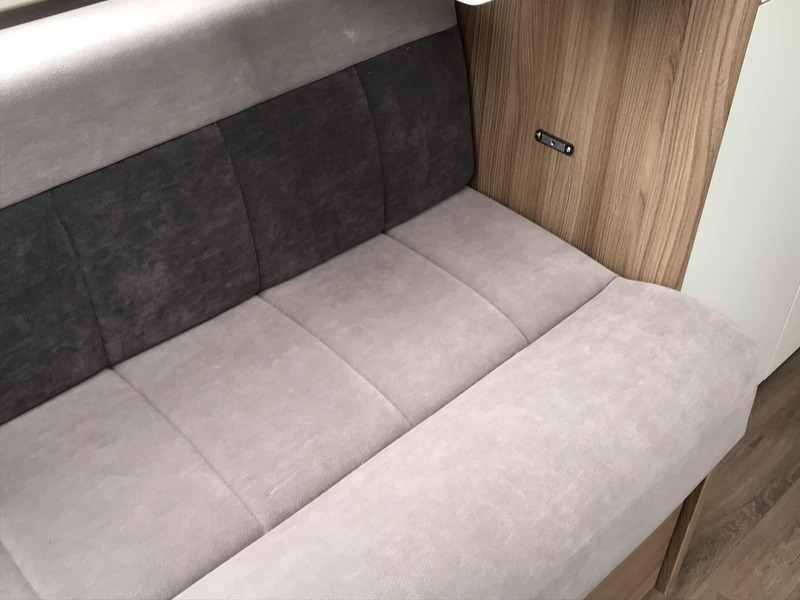 You’ll no doubt already own a hefty towcar, but Elegances are aimed squarely at experienced caravanners who like – nay, demand – the latest luxury! 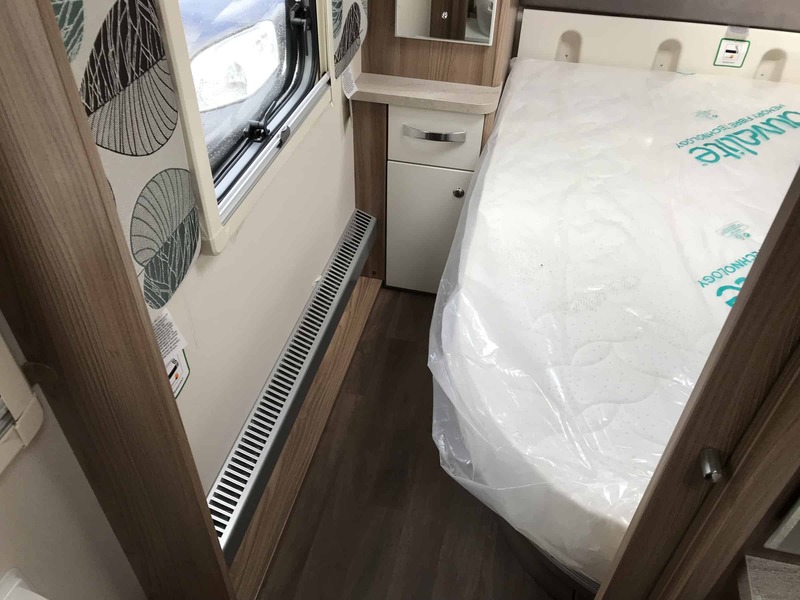 This new 650 caravan (it replaces the French bed 630 model of previous seasons) recognises the demands for a couple wanting a permanent bed with best possible access. 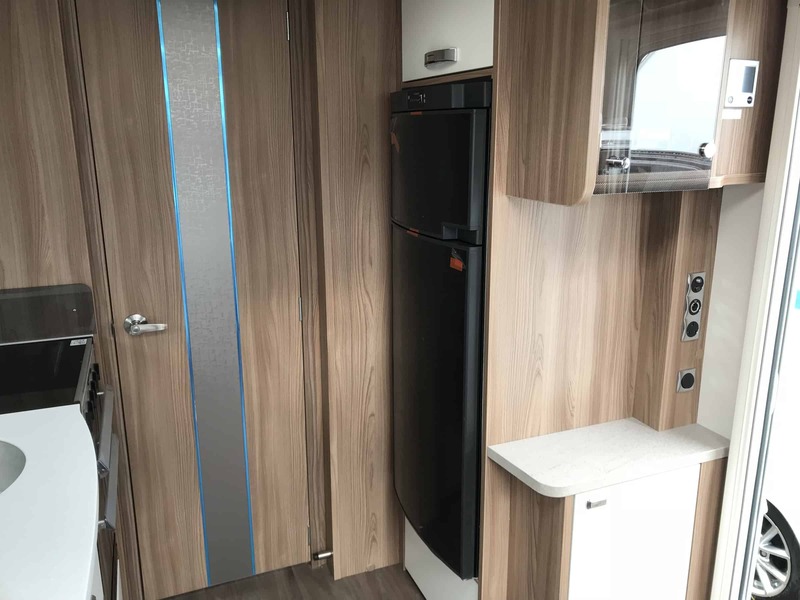 It’s certainly not a rare layout, but it is Swift’s attempts to turn on the style that will surely attract you (do check out the sister model Sterling Continental 650 at the same time). 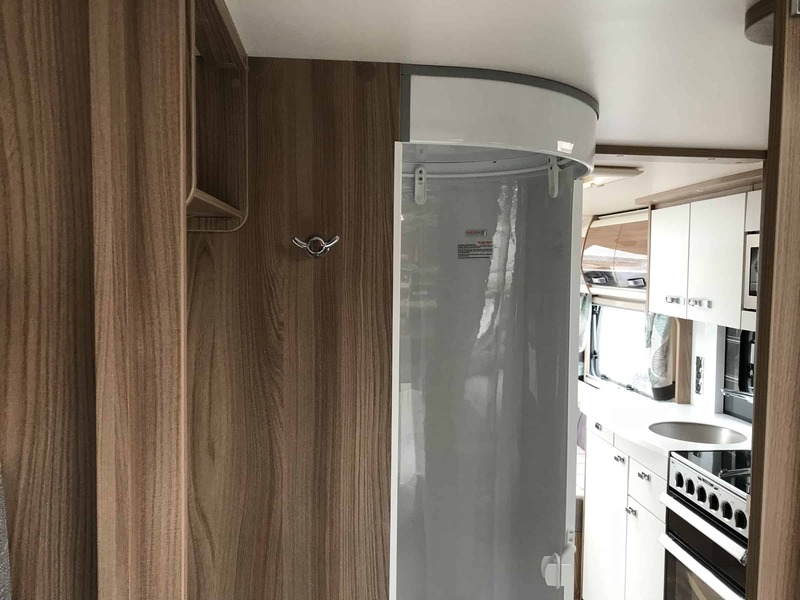 Bodywork uses Swift’s very latest Smart HT timber-free construction, with GRP cladding, and includes a five-layer floor as well as curves and radiused edges, plus flush-fitting windows. 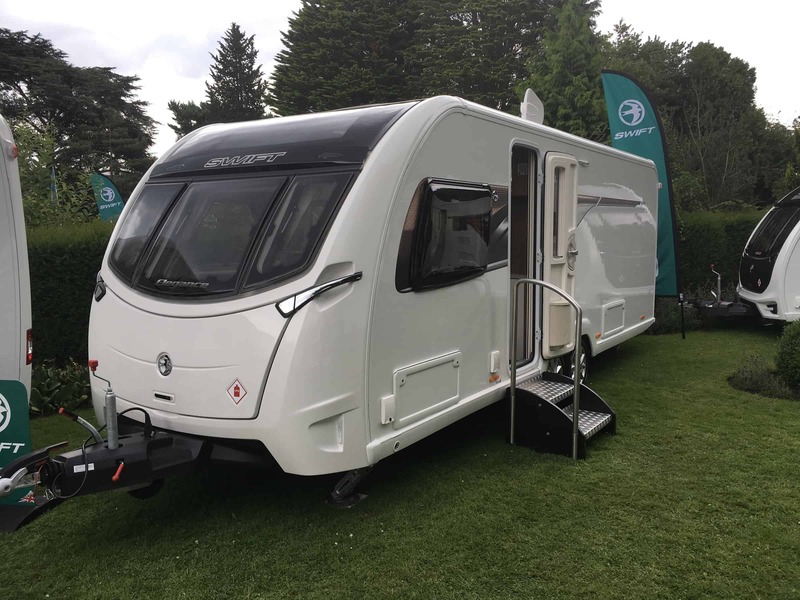 It all adds up to a more streamlined look from the front faring with integrated steps, to the back panel, with fixings already in place for a bike rack, plus a rear-view camera as standard. 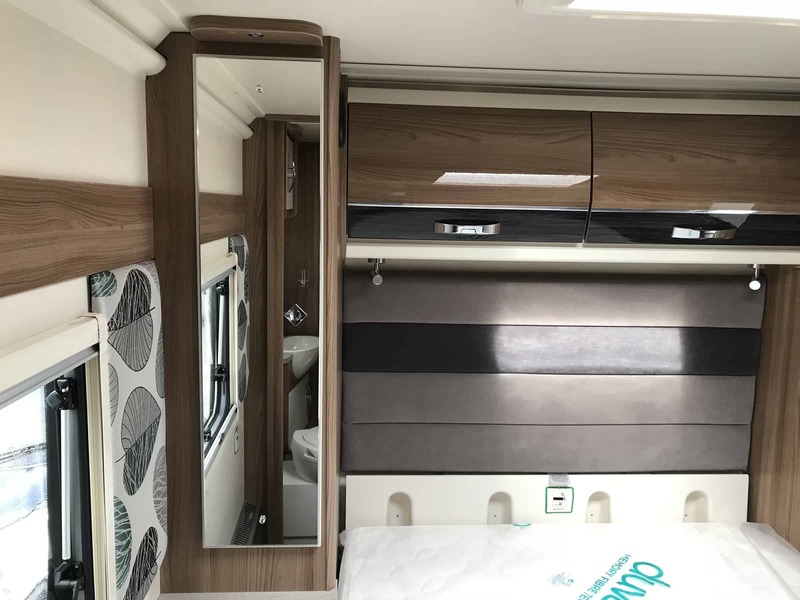 The 650 has the usual twin-axle tributes of being that bit more secure out on the open road, but at the same time trickier to reverse into tighter areas. On an Al-Ko chassis with Euro axle, it also comes with Al-Ko’s ATC anti-snaking control system. 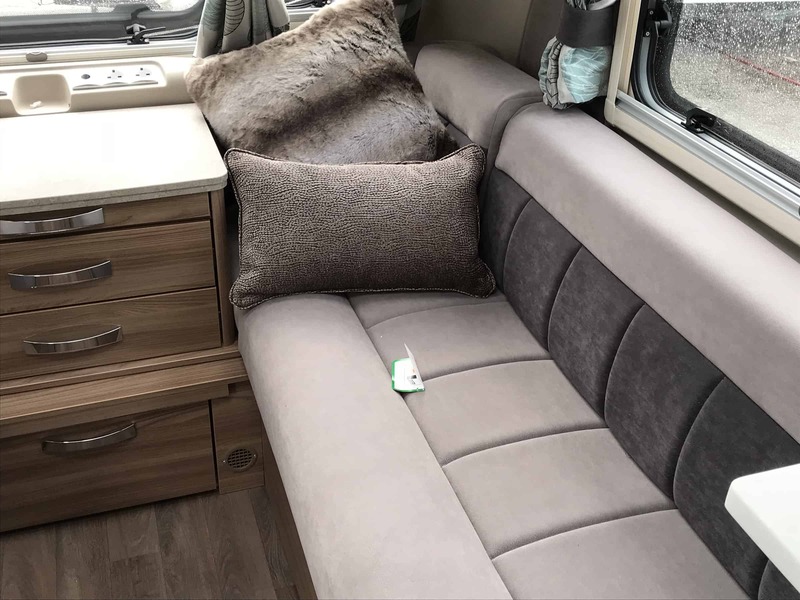 The caravan’s entrance door is set forward, meaning the lounge settees are of differing lengths. Furniture is from Italy’s Tecnoform. 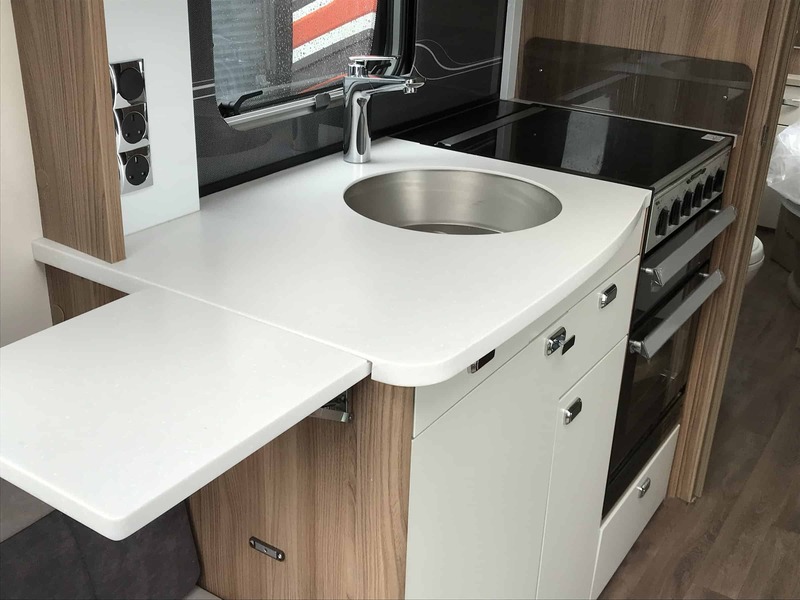 Fallisole is the name of the interior colour scheme that comes in all 2017 Elegances. 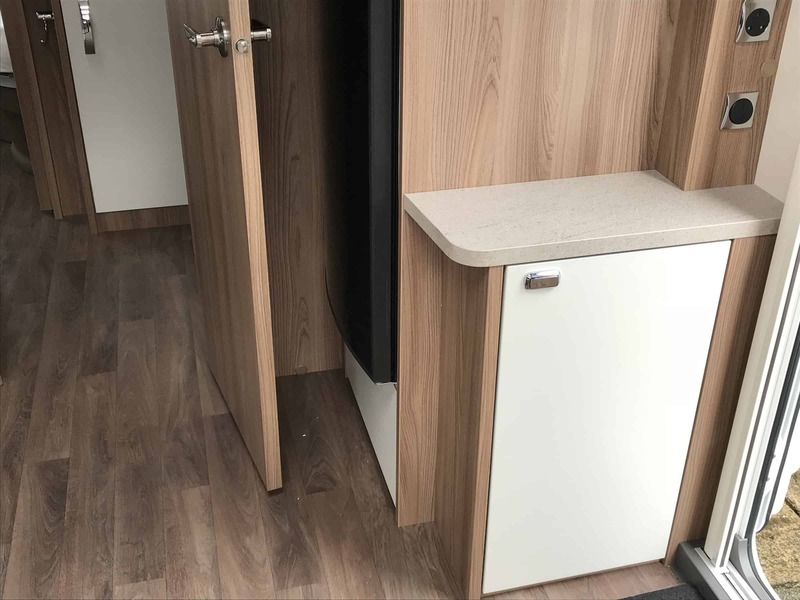 Almost directly opposite the entrance, the kitchen isn’t the largest, but it immediately sets itself apart thanks to the white locker door finish and the “acrylic stone” worktop, the latter also including a rather clever double flip-up worktop extending into the lounge. 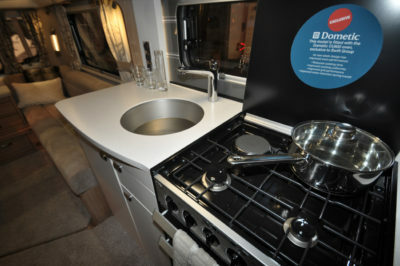 Dometic fittings, include the 190-litre fridge/freezer and cooker with dual-fuel hob (the latter currently exclusive to Swift). 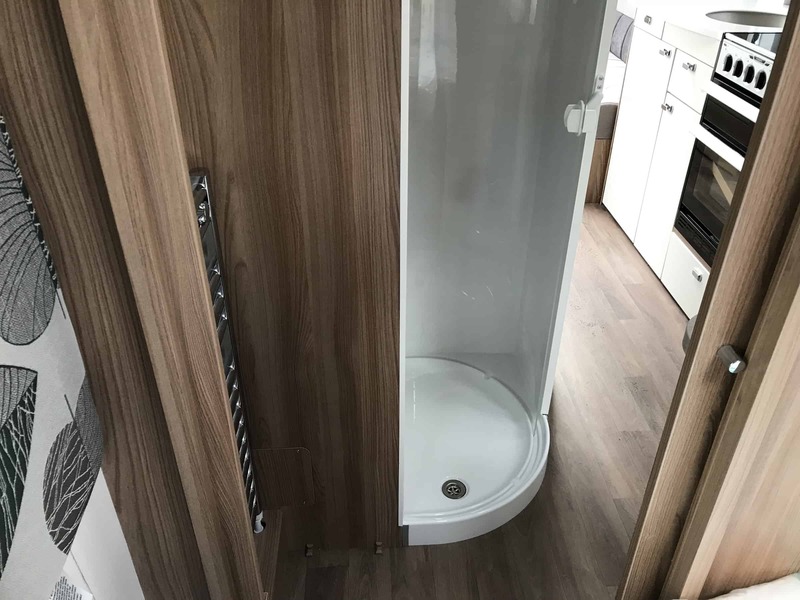 Between the kitchen and the end bedroom, the toilet and showering facilities are across the width of the caravan. 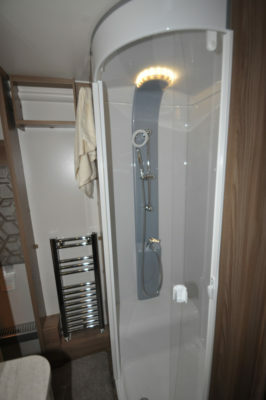 The shower has Ecocamel’s Orbit showerhead – its water-saving capabilities means, in milder conditions, if you keep the water flow down, you could just about manage a continuous hot water supply from the Alde system. 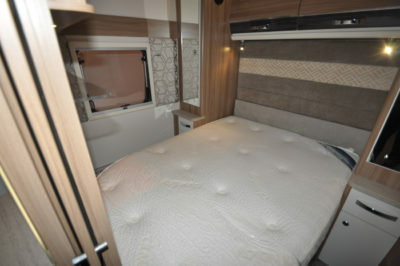 Comfort is king at the back, where the star turn is the island bed with a Duvalay Duvalite mattress. 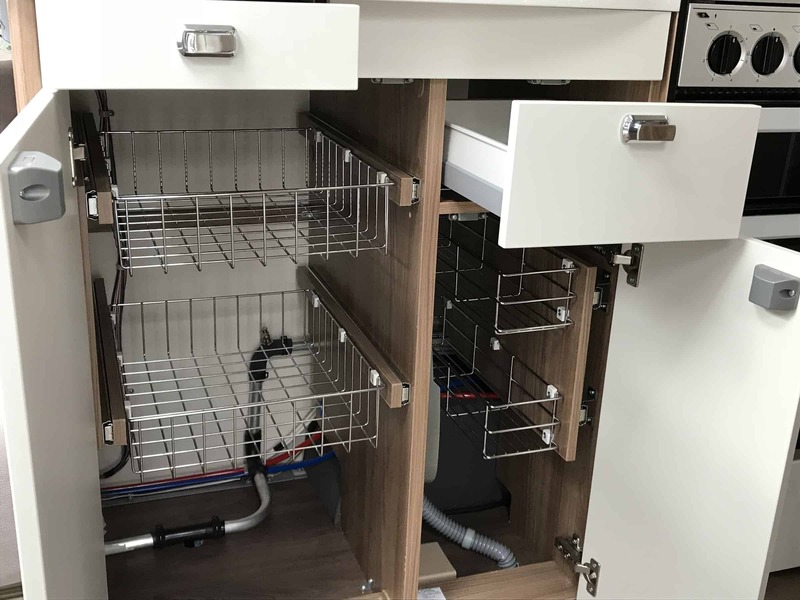 There’s good access to the storage underneath here, too. But, it’s the almost infinite level of detail that are key for Elegance. Swift Command is more than just a gizmo. 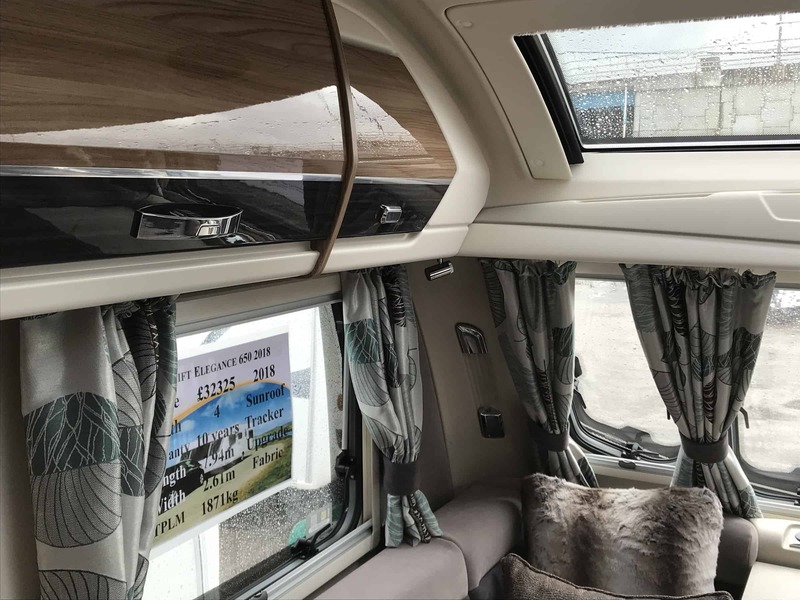 It keeps a watch on power usage, the state of the battery power, as well as temperatures inside and out – even humidity levels in the caravan. And there’s a handy 230V load limiter which you can set between five and 16 amps, so you won’t trip your mains supply. 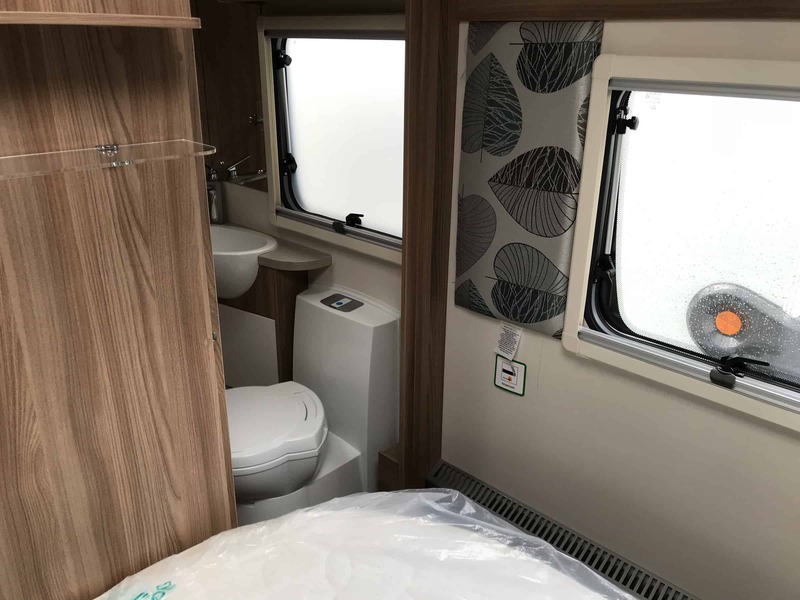 It’s complemented by an app allowing key functions to be operated remotely (as long as you have an internet connection). 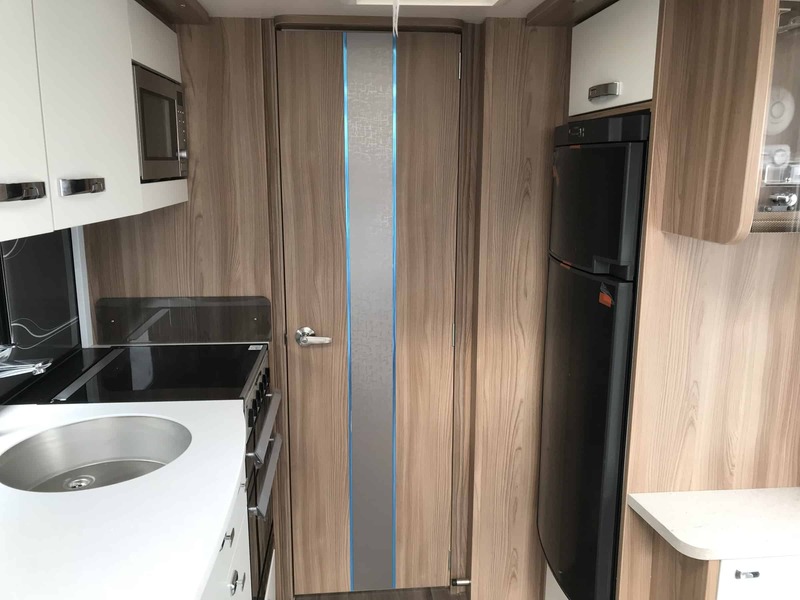 Plus this Swift Elegance caravan is packed with safety and security features, giving you some healthy discounts on your caravan insurance premium. 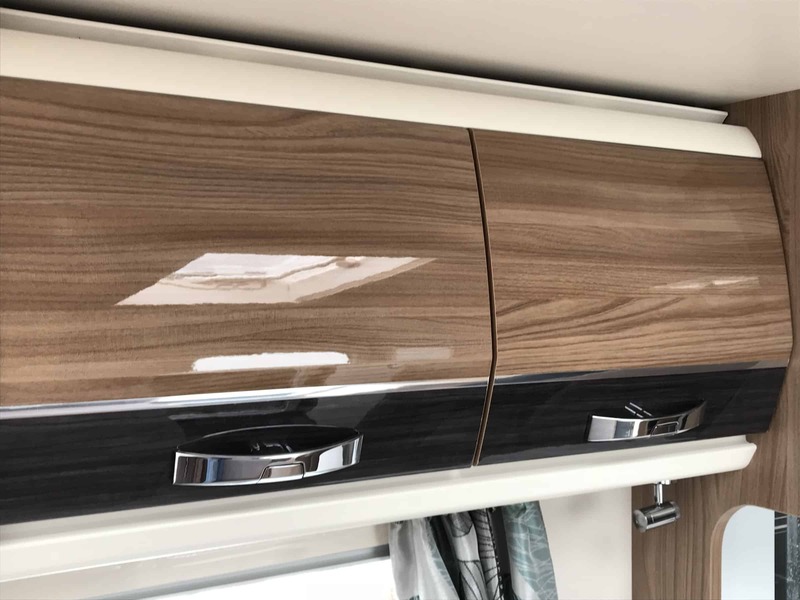 With AL-Ko secure wheel locks, a Thatcham Cat 6 Tracker, infra-red alarm, Al-Ko ATC, and rear view camera as standard, these will attract up to 40% in savings with Caravan Guard. 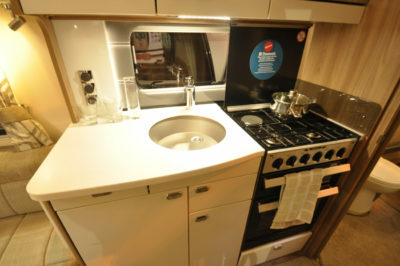 LED lighting abounds, whether direct or ambient, with details in the kitchen splashback and washroom mirror. There’s plenty of natural lighting, too, thanks to the Heki 2 rooflight over the lounge, also providing ventilation. Styling is all down to personal choice, of course. But there can surely only be few who will begrudge Swift’s designers really have worked to make it work here. 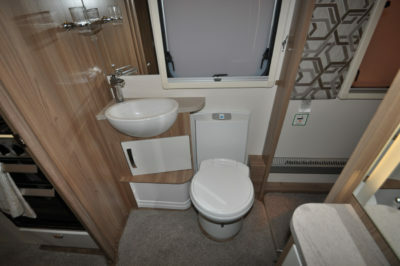 The caravan instantly feels comfortable, and certainly looks the part as a modern touring apartment. Mind you, there’s a correspondingly hefty price tag.